“On November 16, I was taken for a cardiology examination for the first time. After the examination and stress test, I was told that I should have an angio without delay. I guess that my friends, students and readers are curious about my health. I would like to share the state of my health in my 4th open letter sent from Silivri Prison. I have been suffering from a chronic herniated disk since 1986. I refused to be operated on and have been doing abdominal exercises every day for over 30 years to be able to keep stand; I take care of myself while sitting or standing. I have been sleeping with a respiratory device (CPAP) since I was diagnosed with sleep apnea about 20 years ago. Thankfully, my wife gave [them] the device on my hand when I was taken into custody, and fortunately no problem was created for that in Silivri Prison. I have had high blood pressure for about 20 years, so I take two pills every day (Delix Protect and Fludex SR). All medicines are covered by the prison. About ten years ago I was diagnosed with diabetes at the upper limit and started taking a pill every day (Glucofage). Again for about 10 years, I have been taking medication (Crestor 20 mg) 3 days a week due to high cholesterol. I have been taking another medicine (Uricoliz) 3 days a week due to high uric acid for the same period of time. Approximately 10 years ago, I was diagnosed with fatty liver. Unfortunately, I could not get away from that. I have had an enlarged prostate for over a decade. A biopsy was done in 2009 with a suspicion of cancer. In the spring of 2016, an MRI was performed. Thank goodness the results turned out to be negative. Ever since the last examination I have been taking Avodart pills. Ten years ago, double nodules were detected in one of my thyroid glands. Every year, and lastly in the summer of 2017 in Silivri State Hospital, I was examined ultrasonically and no abnormality was seen. A narrowing (30%) was seen in my neck arteries going to the brain about 5 years ago. No progress has been seen in ultrasonic examinations at Silivri State Hospital. In the same year in an MRI examination, calcification started to appear in my heart artery. It was recommended that I walk every day. I take care of that. I walk almost an hour a day in the courtyard of Silivri Prison, never skipping a day. Again, a mass / cyst on the skull was seen in the MRI examination that year. Since it was outside of the skull, no intervention was needed. But I regret that I did not have it removed, because it is getting bigger. In the spring of 2016, I had a colonoscopy and endoscopy for the 4th time. This time there were no polyps in the colon, but in the diagnosis colitis was found in the intestines and gastritis in the stomach; internal hemorrhaging was observed. I take Nexium (20 mg) 3 days a week to protect my stomach. I have gone for a checkup for a skin spot on my back about almost every year for the past 15 years. A needle biopsy was recommended at Silivri State Hospital. When it didn’t respond to the treatment, it was suggested that all of it be removed. I preferred to wait because so much care would be difficult in prison, hoping that one day I would be released. Last May, I had a boil on my leg. When it didn’t respond to treatment, I was operated on at Silivri State Hospital. It was said that the cyst removed was benign. I have been wearing glasses for about 60 years. The eye doctor told me in September 2016 that cataract surgery might be needed. The eye doctors at Silivri did not find surgery necessary yet; they said they could not see the yellowish dot. They did not change my eyeglass prescription (for near and far), but I feel that my eyes are getting tired. I have been using eye drops for over 5 years due to excessive dryness in my eyes. About 5 years ago, I had a hearing loss of 30-35 percent in my ears and started using hearing aids. Since the day I entered prison I have been taking an anti-depressant (cipralex) on the recommendation of a psychiatrist. I reaped too much benefit from it. A few months ago an itchy red spot appeared in my nose. It healed after using an ointment on the recommendation of the dermatologist who diagnosed it as Rosa disease. I had a cardiology examination for the first time at Silivri State Hospital on November 16, 2017. After the examination and stress test, I was told that I should have an angio without delay. I was able to easily walk for an hour a day until a couple of months ago. I cannot manage more than 30 minutes now. Apparently, there have been negative developments in my heart arteries. As a 73-year-old who has lived a very stressful life, you can see the health statement I mentioned in detail above. But life in this prison is not easy. My health was not good when I entered Silivri Prison, and it has gotten worse after 15 months. Immediately after my arrest, my lawyers applied to the Constitutional Court for my release because of my old age and chronic illnesses. But the application was rejected without any delay. I have not received a reply for 15 months for another application I sent due to my freedoms being restricted. The European Court of Human Rights (ECtHR) has decided to immediately review the application I sent on the same grounds on March 8, 2017. The demand of the Ministry of Justice for an extension of the response time to the ECtHR’s questions was finally rejected on November 8, 2017. It is not known when the ECtHR will decide. The İstanbul 13th High Criminal Court, in which I am being tried, sent me to the Institute of Forensic Medicine for the first time on September 18-19, 2017 to confirm that the state of my health is not suitable for being in prison. About a month later, the Institute of Forensic Medicine sent a letter to the court, on October 13, 2017, asking that I be referred to a fully equipped general or university hospital. The receipt of this letter at Silivri Prison took a long time. Finally, I entered Silivri State Hospital on November 10, 2017. There was no cardiologist. Since a urology ultrasound and ENT hearing test were not urgent recommendations, it was said that the completion of the report would take place in February 2018, which will be 6 months since the request. Therefore, the decision of the Institute of Forensic Medicine will not be ready for the 2nd hearing to be held on December 8, 2017; it will be announced months after that. I am not guilty. In light of the current Criminal Code and the Court of Cassation’s current case law, claims of ‘coup plotter’ or ‘membership in a terrorist organization’ cannot be used for me. I will be acquitted at the end of the trial. The only mistake I made was to believe that the Constitution and the European Convention on Human Rights guaranteed freedom of expression and opposition in Turkey. I am very old. Since I have many chronic diseases and my health is getting worse, I have no hope of living for many more years. 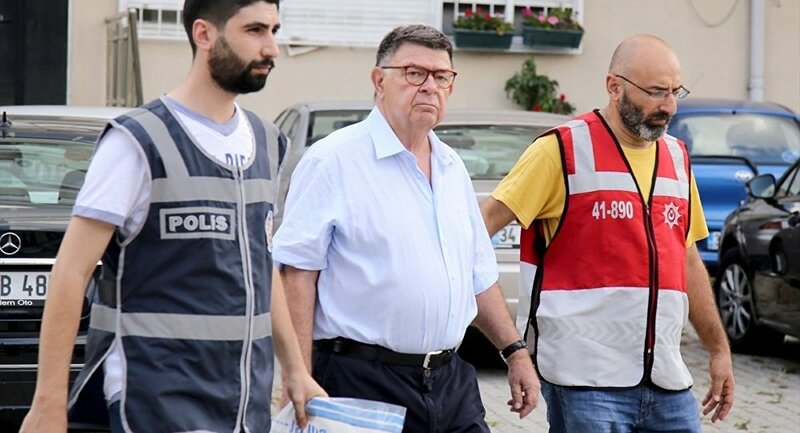 I expect the İstanbul 13th High Criminal Court or the Constitutional Court to decide as soon as possible to allow me to spend my remaining years with my wife, children and grandchildren without a trial. That was a pretty boring letter. But I wanted you to know my situation. With my love and greetings. Turkey is the biggest jailer of journalists in the world. The most recent figures documented by SCF showed that 256 journalists were in jail as of November 21, 2017, most in pre-trial detention. Of those in Turkish prisons, 230 have been arrested pending trial, while only 26 journalists have been convicted and are serving time. Detention warrants are outstanding for 135 journalists who live in exile or remain at large in Turkey. This article originally appeared on the website of the Stockholm Freedom Centre for Freedom (SCF) and edited by Turkish Minute.